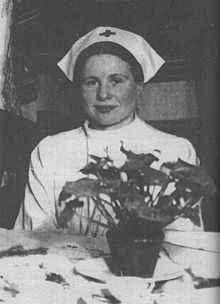 Irena Stanisława Sendler (née Krzyżanowska), also referred to as Irena Sendlerowa in Poland, nom de guerre "Jolanta" (15 February 1910 – 12 May 2008), was a Polish social worker, humanitarian and nurse who served in the Polish Underground during World War II in German-occupied Warsaw, and from October 1943 was head of the children's section of Żegota, the Polish Council to Aid Jews (Polish: Rada Pomocy Żydom). In the 1930s, Sendler conducted her social work as one of the activists connected to the Free Polish University. From 1935 to October 1943, she worked for the Department of Social Welfare and Public Health of the City of Warsaw. She also pursued informal, and during the war conspiratorial activities, such as rescuing Jews, primarily as part of the network of workers and volunteers from that department, mostly women. Sendler participated, with dozens of others, in smuggling Jewish children out of the Warsaw Ghetto and then provided them with false identity documents and shelter with willing Polish families or in orphanages and other care facilities, including Catholic nun convents, saving those children from the Holocaust. The German occupiers suspected Sendler's involvement in the Polish Underground and in October 1943 she was arrested by the Gestapo, but she managed to hide the list of the names and locations of the rescued Jewish children, preventing this information from falling into the hands of the Gestapo. Withstanding torture and imprisonment, Sendler never revealed anything about her work or the location of the saved children. She was sentenced to death but narrowly escaped on the day of her scheduled execution, after Żegota bribed German officials to obtain her release. 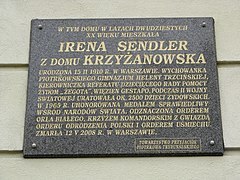 Sendler was born Irena Krzyżanowska on 15 February 1910 in Warsaw, to Dr. Stanisław Krzyżanowski, a physician, and his wife, Janina. She grew up in Otwock, a town about 15 miles (24 km) southeast of Warsaw, where there was a Jewish community. Her father, a humanitarian who treated the very poor, including Jews, free of charge, died in February 1917 from typhus contracted from his patients. After his death, the Jewish community offered financial help for the widow and her daughter, though Janina Krzyżanowska declined their assistance. From 1927, Sendler studied law for two years and then Polish literature at the University of Warsaw, interrupting her studies for several years from 1932 to 1937. She opposed the ghetto benches system practiced in the 1930s at many Polish institutions of higher learning (from 1937 at the University of Warsaw) and defaced the "non-Jewish" identification on her grade card. She reported having suffered from academic disciplinary measures because of her activities and reputation as a communist and philo-Semite. By the outbreak of World War II she submitted her magister degree thesis, but had not taken the final exams. Sendler joined the Union of Polish Democratic Youth (Związek Polskiej Młodzieży Demokratycznej) in 1928; during the war she became a member of the Polish Socialist Party (PPS). She was repeatedly refused employment in the Warsaw school system because of negative recommendations issued by the university, which ascribed radically leftist views to her. Sendler became associated with social and educational units of the Free Polish University (Wolna Wszechnica Polska), where she met and was influenced by activists from the illegal Communist Party of Poland. At Wszechnica Sendler belonged to a group of social workers led by Professor Helena Radlińska; a dozen or more women from that circle would later engage in rescuing Jews. 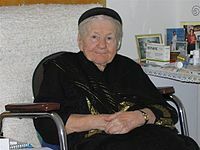 From her social work on-site interviews Sendler recalled many cases of extreme poverty that she encountered among the Jewish population of Warsaw. Sendler was employed in a legal counseling and social help clinic, the Section for Mother and Child Assistance at the Citizen Committee for Helping the Unemployed. She published two pieces in 1934, both concerned with the situation of children born out of wedlock and their mothers. She worked mostly in the field, crisscrossing Warsaw's impoverished neighborhoods, and her clients were helpless, socially disadvantaged women. In 1935, the government abolished the section. Many of its members became employees of the City of Warsaw, including Sendler in the Department of Social Welfare and Public Health. Sendler married Mieczysław Sendler in 1931. He was mobilized for war, captured as a soldier in September 1939 and remained in a German prisoner of war camp until 1945; they divorced in 1947. She then married Stefan Zgrzembski (born Adam Celnikier), a Jewish friend and wartime companion, by whom she had three children, Janina, Andrzej (who died in infancy), and Adam (who died of heart failure in 1999). In 1957 Zgrzembski left the family; he died in 1961 and Irena remarried her first husband, Mieczysław Sendler. Ten years later they divorced again. Soon after the German invasion, on 1 November 1939, the German occupation authorities ordered Jews removed from the staff of the municipal Social Welfare Department where Sendler worked and barred the department from providing any assistance to Warsaw's Jewish citizens. Sendler with her colleagues and activists from the department's PPS cell became involved in helping the wounded and sick Polish soldiers. On Sendler's initiative the cell began generating false medical documents, needed by the soldiers and poor families to obtain aid. Her PPS comrades unaware, Sendler extended such assistance also to her Jewish charges, who were now officially served only by the Jewish community institutions. With Jadwiga Piotrowska, Jadwiga Sałek-Deneko and Irena Schultz, Sendler also created other false references and pursued ingenious schemes in order to help Jewish families and children excluded from their department's social welfare protection. Around four hundred thousand Jews were crowded into a small portion of the city designated as the Warsaw Ghetto and the Nazis sealed the area in November 1940. As employees of the Social Welfare Department, Sendler and Schultz gained access to special permits for entering the ghetto to check for signs of typhus, a disease the Germans feared would spread beyond the ghetto. Under the pretext of conducting sanitary inspections, they brought medications and cleanliness items and sneaked clothing, food, and other necessities into the ghetto. For Sendler, one initial motivation for the expanding ghetto aid operation were her friends, acquaintances and former colleagues who ended up on the Jewish side of the wall, beginning with Adam Celnikier (he managed to leave the ghetto at the time of its liquidation). Sendler and other social workers would eventually help the Jews who escaped or arrange for smuggling out babies and small children from the ghetto using various means available. Transferring Jews out of the ghetto and facilitating their survival elsewhere became an urgent priority in the summer of 1942, at the time of the Great Action. This work was done at huge risk, as—since October 1941—giving any kind of assistance to Jews in German-occupied Poland was punishable by death, not just for the person who was providing the help but also for their entire family or household. Sendler joined the Polish Socialists, a left-wing branch of the Polish Socialist Party (PPS). The Polish Socialists evolved into the Polish Socialist Workers' Party (RPPS), which cooperated with the communist Polish Workers' Party (PPR). 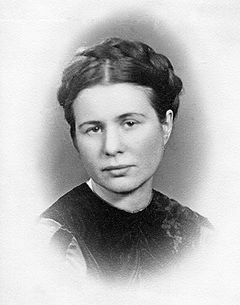 Sendler was known there by her conspiratorial pseudonym Klara and among her duties were searching for places to stay, issuing fake documents and being a liaison, guiding activists to clandestine meetings. In the RPPS there were Poles she knew, involved in saving Jews, as well as Jews that she had helped. Sendler participated in the secret life of the ghetto. She described a commemoration event there, on the anniversary of the October Revolution but in the spirit of the Polish leftist tradition; it included artistic performances by children. While in the ghetto, she wore a Star of David as a sign of solidarity with the Jewish people. The Jewish ghetto was a functioning community and to many Jews seemed the safest available place for themselves and their children. In addition, survival on the outside was plausible only for people with access to financial resources. This calculation lost its validity in July 1942, when the Germans proceeded with the liquidation of the ghetto in Warsaw, to be followed by the extermination of its residents. Sendler and her associates—as related by Jonas Turkow—could take a small number of children, and a certain number could be accepted and supported by Christian institutions, but a larger-scale action was prevented by the lack of funds. Initial funds for transfer and maintenance of ghetto children were provided by members of the Jewish community, still in existence, in cooperation with women from the Welfare Department. Sendler and others, in accordance with their mission, wanted to help the neediest children (such as orphans) first. Turkow, who contacted Wanda Wyrobek and Sendler to take out of the ghetto and arrange care for his daughter Margarita, wanted to prioritize children of the most "deserving" (accomplished) people. During the Great Action, Sendler kept entering or trying to enter the ghetto. She made desperate attempts to save her friends, but among her former Welfare Department associates unable or unwilling to leave the ghetto were Ewa Rechtman and Ala Gołąb-Grynberg. According to Jadwiga Piotrowska, who saved numerous Jewish children, during the Great Action people from the Welfare Department operated individually (had no organization or leader). Other accounts suggest that women from that group concentrated on making arrangements for Jews who had already left the ghetto, and that Sendler in particular took care of adults and adolescents. Żegota (the Council to Aid Jews) was an underground organization that originated on 27 September 1942 as the Provisional Committee to Aid Jews, led by Zofia Kossak-Szczucka, a resistance fighter and writer. By that time, most Polish Jews were no longer alive. Żegota, established on 4 December 1942, was a new form of the committee, expanded by the participation of Jewish parties and chaired by Julian Grobelny. It was financed by the founder of the Provisional Committee, the Government Delegation for Poland, a Polish Underground State institution representing the Polish government-in-exile. Working for Żegota from January 1943, Sendler functioned as a coordinator of the Welfare Department network. They distributed money grants that became available from Żegota. Regular payments, however insufficient for the needs, enhanced their ability to assist the hiding Jews. In 1963, Sendler specifically listed 29 people she worked with within the Żegota operation, adding that 15 more perished during the war. In regard to the action of saving Jewish children, according to a 1975 opinion written by Sendler's former Welfare Department co-workers, she was the most active and organizationally gifted of participants. During the Warsaw Ghetto Uprising, a network of emergency shelters was created by Sendler's group: private residencies where Jews could be temporarily housed, while Żegota worked on producing documents and finding longer-term locations for them. Many Jewish children went through the homes of Izabella Kuczkowska, Zofia Wędrychowska, and other social workers. Helena Rybak and Jadwiga Koszutska were activists from the communist underground. In August 1943, Żegota set up its children's section, directed by Aleksandra Dargiel, a manager in the Central Welfare Council (RGO). Dargiel, overwhelmed by her RGO duties, resigned in September and proposed Sendler to be her replacement. Sendler, then known by her nom de guerre Jolanta, took over the section from October 1943. On 18 October 1943, Sendler was arrested by the Gestapo. As they ransacked her house, Sendler tossed the lists of children to her friend Janina Grabowska, who hid the list in her loose clothing. Should the Gestapo access this information, all children would be compromised, but Grabowska was never searched. The Gestapo took Sendler to their headquarters and beat her brutally. Despite this, she refused to betray any of her comrades or the children they rescued. She was placed in the Pawiak prison, where she was subjected to further interrogations and beatings, and from there on 13 November taken to another location, to be executed by firing squad. According to biographer Anna Mieszkowska and Sendler, these events took place on 20 January. Her life was saved, however, because the German guards escorting her were bribed, and she was released on the way to the execution. Sendler was freed due to the efforts of Maria Palester, a fellow Welfare Department activist, who obtained the necessary funds from Żegota chief Julian Grobelny; she used her contacts and a teenage daughter to transfer the bribe money. On 30 November, Warsaw's mayor Julian Kulski asked the German authorities for permission to re-employ Sendler in the Welfare Department with back-pay for the period of her imprisonment. 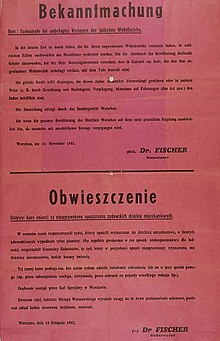 Permission was granted on 14 April 1944, but Sendler found it prudent to remain in hiding, as Klara Dąbrowska, a nurse. Already in mid-December 1943, she resumed her duties as manager of the children's section of Żegota. During the Warsaw Uprising, Sendler worked as a nurse in a field hospital, where a number of Jews were hidden among other patients. She was wounded by a German deserter she encountered while searching for food. She continued to work as a nurse until the Germans left Warsaw, retreating before the advancing Soviet troops. Sendler's hospital, now at Okęcie, previously supported by Żegota, ran out of resources. She hitchhiked in military trucks to Lublin, to obtain funding from the communist government established there, and then helped Maria Palester to reorganize the hospital as the Warsaw's Children Home. Sendler also resumed other social work activities and quickly advanced within the new structures, in December 1945 becoming head of the Department of Social Welfare in Warsaw's municipal government. She ran her department according to concepts, radical at the time, that she had learned from Helena Radlińska at the Free University. Sendler and her co-workers gathered all of the records with the names and locations of the hidden Jewish children and gave them to their Żegota colleague Adolf Berman and his staff at the Central Committee of Polish Jews. Almost all of the children's parents had been killed at the Treblinka extermination camp or had gone missing. Berman and Sendler both felt that the Jewish children should be reunited with "their nation", but argued vehemently about specific aims and methods; most children were taken out of Poland. Over the years, among Sendler's social and formal functions were a membership in Warsaw City Council, chairmanships of the Commission for Widows and Orphans and of the Health Commission there, activity in the League of Women and in the managing councils of the Society of Friends of Children and the Society for Lay Schools. Sendler's husband, Stefan Zgrzembski, never shared her enthusiasm for the post-1945 reality. Their marriage kept deteriorating. According to Janina Zgrzembska, their daughter, neither parent paid much attention to the two children. Sendler was entirely consumed by her social work passion and career, at the expense of her own offspring, who were raised by a housekeeper. Around 1956, Sendler asked Teresa Körner, whom she helped during the war and who was now in Israel, to assist her with immigration to Israel with children, who were Jewish and not safe in Poland. Körner discouraged Sendler's move. In the spring of 1967, suffering from a variety of health problems, including a heart condition and anxiety disorder, Sendler applied for disability pension. She was dismissed from the school's vice-principal position in May 1967, shortly before the Arab–Israeli War. From the fall of 1967, she continued working at the same school as a teacher, manager of teacher workshops and librarian, until her 1983 retirement. According to Sendler, in 1967 her daughter Janina was removed from the already published list of students admitted to the University of Warsaw, but Janina reported that she had simply failed to satisfy the admission requirements. The antisemitic campaign of 1967–68 in Poland left Sendler deeply traumatized. Sendler never told her children of the Jewish origin of their father; Janina Zgrzembska found out as an adult. It wouldn't make any difference, she said: the way they were brought up, race or origin didn't matter. In 1980, Sendler joined the Solidarity movement. She lived in Warsaw for the remainder of her life. She died on 12 May 2008, aged 98, and is buried in Warsaw's Powązki Cemetery. In 1965, Sendler was recognized by Yad Vashem as one of the Polish Righteous Among the Nations. [a] In 1983 she was present when a tree was planted in her honor at the Garden of the Righteous Among the Nations. In 1991, Sendler was made an honorary citizen of Israel. On 12 June 1996, she was awarded the Commander's Cross of the Order of Polonia Restituta. She received a higher version of this award, the Commander's Cross with Star, on 7 November 2001. Sendler's achievements were largely unknown in North America until 1999, when students at a high school in Uniontown, Kansas, led by their teacher Norman Conard, produced a play based on their research into her life story, which they called Life in a Jar. The play was a surprising success, staged over 200 times in the United States and abroad, and it significantly contributed to publicizing Sendler's story. In March 2002, B'nai Jehudah Temple of Kansas City presented Sendler, Conard, and the students who produced the play with its annual award "for contributions made to saving the world" (Tikkun olam award). The play was adapted for television as The Courageous Heart of Irena Sendler (2009), directed by John Kent Harrison, in which Sendler was portrayed by actress Anna Paquin. In 2003, Pope John Paul II sent Sendler a personal letter praising her wartime efforts. On 10 November 2003, she received the Order of the White Eagle, Poland's highest civilian decoration, and the Polish-American award, the Jan Karski Award "For Courage and Heart", given by the American Center of Polish Culture in Washington, D.C. 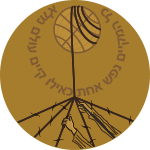 In 2006, Polish NGOs Centrum Edukacji Obywatelskiej and Stowarzyszenie Dzieci Holocaustu, the Ministry of Foreign Affairs of Poland, and the Life in a Jar Foundation established the Irena Sendler's Award "For Repairing the World" (pl:Nagroda imienia Ireny Sendlerowej "Za naprawianie świata"), awarded to Polish and American teachers. The Life in a Jar Foundation is a foundation dedicated to promoting the attitude and message of Irena Sendler. In 2007, and again in 2008, Sendler was nominated for the Nobel Peace Prize, with support from numerous prominent personalities along with the International Federation of Social Workers. On 14 March 2007, Sendler was honoured by the Senate of Poland, and a year later, on 30 July, by the United States Congress. On 11 April 2007, she received the Order of the Smile; at that time, she was the oldest recipient of the award. In 2007 she became an honorary citizen of the cities of Warsaw and Tarczyn. In April 2009 Sendler was posthumously granted the Humanitarian of the Year award from The Sister Rose Thering Endowment, and in May 2009, Sendler was posthumously granted the Audrey Hepburn Humanitarian Award. Around this time American filmmaker Mary Skinner filmed a documentary, Irena Sendler, In the Name of Their Mothers (Polish: Dzieci Ireny Sendlerowej), featuring the last interviews Sendler gave before her death. The film made its national U.S. broadcast premiere through KQED Presents on PBS in May 2011 in honor of Holocaust Remembrance Day and went on to receive several awards, including the 2012 Gracie Award for outstanding public television documentaries. In 2013 the walkway in front of the POLIN Museum of the History of Polish Jews in Warsaw was named after Sendler. In 2010 a memorial plaque commemorating Sendler was added to the wall of 2 Pawińskiego Street in Warsaw – a building in which she worked from 1932 to 1935. In 2015 she was honoured with another memorial plaque at 6 Ludwiki Street, where she lived from the 1930s to 1943. Several schools in Poland have also been named after her. In 2016, a permanent exhibit was established to honor Sendler's life at the Lowell Milken Center for Unsung Heroes museum, in Fort Scott, KS. In 2010, Polish historian Anna Mieszkowska wrote a biography Irena Sendler: Mother of the Children of the Holocaust. In 2011, Jack Mayer tells the story of the four Kansas school girls and their discovery of Irena Sendler in his novel Life in a Jar: The Irena Sendler Project. In 2016, Irena's Children, a book about Sendler written by Tilar J. Mazzeo, was released by Simon & Schuster. A version adapted to be read by children was created by Mary Cronk Farell. Another children's picture book titled Jars of Hope: How One Woman Helped Save 2,500 Children During the Holocaust, is written by Jennifer Roy. Sendlerowa. W ukryciu ('Sendler: In Hiding'), a biography and book about the people and events related to Sendler's wartime activities, was written by Anna Bikont and published in 2017. The book received the 2018 Ryszard Kapuściński Award for Literary Reportage. Irena Sendler in 1942 (colourised photo). Irena Sendler's tree on the Avenue of the Righteous at Yad Vashem in Israel. 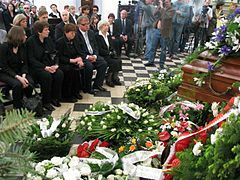 Irena Sendler's funeral, May 2008. Irena Sendler's grave in Warsaw's Powązki Cemetery. The headstone on Irena Sendler's grave. A memorial plaque on the wall of 2 Pawińskiego Street in Warsaw. The walkway in front of the POLIN Museum of the History of Polish Jews named after Irena Sendler. A bronze plaque in Piotrków Trybunalski telling some of her story. a.^ Sendler was one of the first Poles recognized as Righteous Among the Nations due to the efforts of Jonas Turkow, who stated for a Polish language periodical in Israel: "This noble woman ... worked for Żegota and saved hundreds of Jewish children, placing them in orphanages, convents and other places". The number of Jewish children saved through Sendler's efforts is not known. The Social Welfare Department of the Central Committee of Polish Jews stated in January 1947 that Sendler saved at least several dozen Jewish children. Later in her life, Sendler repeatedly claimed that she had saved 2,500 Jewish children. When Michał Głowiński, who as a child survived the war with Sendler's help, was working on his book The Black Seasons in the late 1990s, Sendler insisted that he writes about the 2,500 children she saved. As Głowiński later told Anna Bikont, he felt obliged to comply because "one cannot refuse Sendler". Sendler often spoke of the list of 2,500 children she produced, kept in two bottles and gave to Adolf Berman, but no such list has ever materialized and Berman never mentioned its existence. For the first time she talked about the list and the 2,500 saved children (and adults) in 1979; back then, however, she did not suggest that she was personally responsible for their survival and named twenty four people also involved in their rescue. b.^ Actual events tend to be difficult to reconstruct because later, purposely or inadvertently, for different audiences and at different times, Sendler told different stories with aspects that were mutually incompatible or contrary to known facts. For example, in 1998 Sendler claimed that the communist authorities kept refusing to issue her passport for twenty years, despite the invitations from Yad Vashem she had been receiving during that period. Anna Bikont found those claims to be false. The passport was refused 1981, after the first such invitation, because of the lack of diplomatic relations with Israel, and the decision was reversed in 1983. Previously Sendler also had a passport: on several occasions she went to Sweden to visit her son, who was receiving medical treatment there. ^ Irena Sendler. An unsung heroine. Lest We Forget. Retrieved 2 November 2012. ^ Baczynska, Gabriela (12 May 2008). Jon Boyle, ed. "Sendler, savior of Warsaw Ghetto children, dies". Reuters. Retrieved 17 September 2013. ^ "Rethinking the Polish Underground". Yeshiva University News. ^ Atwood, Kathryn (2011). Women Heroes of World War II. Chicago: Chicago Review Press. p. 48. ISBN 9781556529610. ^ "Facts about Irena — Life in a Jar". Retrieved 29 August 2016. ^ a b c d e f g h i j k l "Polscy Sprawiedliwi – Przywracanie Pamięci". sprawiedliwi.org.pl (in Polish). ^ "Irena Sendler — Rescuer of the Children of Warsaw". www.chabad.org. Retrieved 29 August 2016. ^ Joshua D. Zimmerman (2015). The Polish Underground and the Jews, 1939–1945. Cambridge University Press. p. 304. ^ a b "Biografia Ireny Sendlerowej". tak.opole.pl (in Polish). Zespół Szkół TAK im. Ireny Sendlerowej. ^ a b Staff writer (22 May 2008), The Economist obituary. Retrieved 8 April 2013. ^ a b c d e f g Magdalena Grochowska (12 May 2008), "Lista Sendlerowej – reportaż z 2001 roku" (The Sendler list – newspaper report from 2001) at DzieciHolocaustu.org.pl. See also: Lista Sendlerowej (pay per view) at Gazeta Wyborcza. Retrieved 23 March 2018. ^ Anna Mieszkowska (January 2011). Irena Sendler: Mother of the Children of the Holocaust. Praeger. p. 26. ISBN 978-0-313-38593-3. ^ "Irena Sendler: we tell you the story of a Holocaust heroine". Mail Online. ^ Richard Z. Chesnoff, "The Other Schindlers: Steven Spielberg's epic film focuses on only one of many unsung heroes" (archive), U.S. News and World Report, 13 March 1994. ^ a b c d e "Irena Sendler". Jewish Virtual Library. ^ a b Monika Scislowska, Associated Press Writer (12 May 2008). "Polish Holocaust hero dies at age 98". USA Today. Retrieved 8 April 2013. ^ Kurek, Ewa (1997). Your Life is Worth Mine: How Polish Nuns Saved Hundreds of Jewish Children in German-occupied Poland, 1939-1945. Hippocrene Books. ISBN 9780781804097. ^ Kadar, Marlene (2015-07-31). Working Memory: Women and Work in World War II. Wilfrid Laurier Univ. Press. ISBN 9781771120364. ^ Zamoyski, Adam (2009). Poland: A History. Harper Press. ISBN 9780007282753. ^ Baker, Catherine (2016-11-18). Gender in Twentieth-Century Eastern Europe and the USSR. Macmillan International Higher Education. ISBN 9781137528049. ^ Deák, István; Gross, Jan T.; Judt, Tony (2009-11-06). The Politics of Retribution in Europe: World War II and Its Aftermath. Princeton University Press. ISBN 1400832055. ^ Tomaszewski, Irene; Werbowski, Tecia (2010). Code Name Żegota: Rescuing Jews in Occupied Poland, 1942-1945 : the Most Dangerous Conspiracy in Wartime Europe. ABC-CLIO. ISBN 9780313383915. ^ a b c Atwood, Kathryn (2011). Women Heroes of World War II. Chicago: Chicago Review Press. p. 46. ISBN 9781556529610. ^ Hevesi, Dennis (13 May 2008). "Irena Sendler, Lifeline to Young Jews, Is Dead at 98". The New York Times. ISSN 0362-4331. Retrieved 28 April 2015. ^ Mieszkowska, Anna (2014). Prawdziwa Historia Ireny Sendlerowej. Warszawa: Marginesy. ISBN 978-83-64700-58-3. ^ a b Olga Wróbel, Bikont: Na każdym kroku pilnie wykluczano Żydów z polskiej społeczności ('Bikont: The Jews were diligently excluded from Polish society at every step'). 2 February 2018. Bikont: Na każdym kroku. Krytyka Polityczna. Retrieved 7 February 2018. ^ a b c "Sendler Irena – WIEM, darmowa encyklopedia" (in Polish). PortalWiedzy.onet.pl. Retrieved 27 April 2015. ^ "Irena Sendler, who saved 2,500 Jews from Holocaust, dies at 98". Retrieved 27 April 2015. ^ "The Story of Irena Sendler (February 15, 1910 — May 12, 2008)". Taube Philanthropies. [Also in:] "Award named for Righteous Gentile". European Jewish Congress. 2 June 2008 – via Internet Archive. 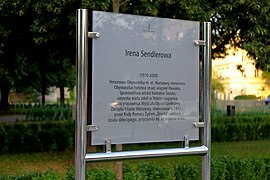 ^ "Irena Stanisława Sendler (1910–2008) – dzieje.pl" (in Polish). Retrieved 27 April 2015. ^ Louette Harding (1 August 2008). "Irena Sendler: a Holocaust heroine". The Daily Mail. Retrieved 8 April 2013. ^ David M. Dastych (16 May 2008). "Irena Sendler: Compassion and Courage". CanadaFreePress.com. Retrieved 8 April 2013. ^ a b Zawadzka, Maria. "TREES OF IRENA SENDLER AND JAN KARSKI IN THE GARDEN OF THE RIGHTEOUS". Polish Righteous. POLIN Museum of the History of Polish Jews. Retrieved 5 February 2017. ^ "Irena Sendler". Jewish Virtual Library. American-Israeli Cooperative Enterprise (AICE). Retrieved 5 February 2017. ^ "Krzyz Komandorski Orderu Odrodzenia Polski..." (in Polish). Retrieved 27 April 2015. ^ "About the Project – Life in a Jar". Retrieved 27 April 2015. ^ Richard Maurer (ram-30) (19 April 2009). "The Courageous Heart of Irena Sendler (TV Movie 2009)". IMDb. ^ "List Papieża do Ireny Sendler [Letter of the Pope to Irena Sendler]". wyborcza.pl (in Polish). Retrieved 27 April 2015. ^ Scott T. Allison; George R. Goethals (2011). Heroes: What They Do and Why We Need Them. Oxford University Press. p. 24. ISBN 978-0-19-973974-5. ^ Warszawa, Grupa. "The Association of "Children of the Holocaust" in Poland". www.dzieciholocaustu.org.pl (in Polish). Retrieved 27 April 2015. ^ "Opis konkursu". Retrieved 27 April 2015. ^ a b "Polscy Sprawiedliwi – Przywracanie Pamięci". www.sprawiedliwi.org.pl (in Polish). Retrieved 27 April 2015. ^ Dana Platter. "Poland's hero, Irena Sendler, nominated to Nobel Prize" [Irena Sendler – polska bohaterka nominowana do Nagrody Nobla]. PoloniaInfo. Retrieved 5 February 2017. ^ Wyszyński, Kuba. "Irena Sendler nie żyje". www.jewish.org.pl (in Polish). Archived from the original on 25 January 2016. Retrieved 27 April 2015. ^ "IRENA SENDLEROWA Kawalerem Orderun Uśmiechu". OrderUsmiechu.pl (in Polish). Retrieved 27 April 2015. ^ "Nagroda im. Ireny Sendlerowej". NagrodaIrenySendlerowej.pl (in Polish). Retrieved 27 April 2015. ^ Tarczyn official website (2017), "Irena Sendler." Honorary citizen, lived in Tarczyn before the invasion. ^ Smolen, Courtney. "Executive Director of NJ Commission on Holocaust Education to Bestow Honorary Award to CSE Professor, April 19". NJ.com. Retrieved 5 February 2017. ^ "Irena Sendler awarded the Audrey Hepburn Humanitarian Award". www.audrey1.org. Retrieved 27 April 2015. ^ "PBS National Premiere of IRENA SENDLER In the Name of Their Mothers on May 1st, National Holocaust Remembrance Day". KQED's Pressroom. ^ "SF-Krakow Sister Cities Association – Irena Sendler Documentary Film Wins 2012 Gracie Award". www.sfkrakow.org. Retrieved 27 April 2015. ^ "Aleja Ireny Sendlerowej, Honorowej Obywatelki m.st. Warszawy". www.radawarszawy.um.warszawa.pl (in Polish). Retrieved 27 April 2015. ^ "Odsłonięto tablicę upamiętniającą Irenę Sendlerową" (in Polish). Retrieved 24 June 2015. ^ a b "About the Project". Life in a Jar: The Irena Sendler Project. Retrieved 5 February 2017. ^ "Lowell Milken Center for Unsung Heroes - Freedom's Frontier National Heritage Area". Retrieved 2018-07-09. ^ Mieszkowska, Anna. "Prawdziwa historia Ireny Sendlerowej". Retrieved 5 February 2017. ^ "Three Twice-told stories". Toronto Star, 12 November 2016, page E22. Wikimedia Commons has media related to Irena Sendlerowa. This page was last edited on 31 March 2019, at 12:57 (UTC).